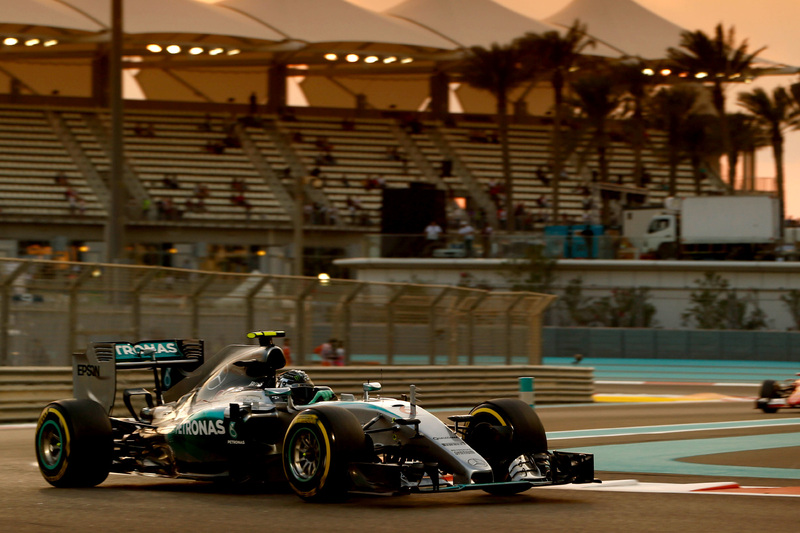 Nico Rosberg snatched pole position from teammate Lewis Hamilton with a phenomenal last-gasp lap in Abu Dhabi. Rosberg and Hamilton were closely matched throughout qualifying, and both set session-best middle sectors on their final laps, but the German’s last sector found three-tenths over the world champion to take his sixth consecutive pole position. Rosberg has the opportunity to win his third consecutive sixth overall grand prix for the season, making a significant break from the Hamilton midseason dominance that won his teammate the title, and the German admitted victory in Abu Dhabi would be an ideal transition into 2016. “Of course whatever we learn this year helps going into next year, so of course it would be great to finish on a high. Hamilton was similarly dismissive of his fifth consecutive qualifying loss, despite suggesting in Brazil that “something” in the car had changed since Singapore to cause his dip in form. Kimi Räikkönen was third for Ferrari, filling the place normally occupied by teammate Sebastian Vettel. The sister Ferrari, however, was unable to get out of Q1 after a critical strategy miscommunication in a massive season-ending shock. Sergio Perez qualified a sensational fourth, just one-tenth behind Räikkönen and three-tenths ahead of Daniel Ricciardo in fifth. The Australian found most of his time when setting the session’s second-best third-sector time, offsetting the time lost in the first two sectors due to his underpowered Renault engine. Valtteri Bottas said he extracted the maximum from his Williams-Mercedes for sixth place, two-tenths behind Ricciardo and just three-hundredths ahead of Nico Hülkenberg in the second Force India in seventh and his teammate in eighth. Daniil Kvyat qualified ninth and 0.4 seconds behind teammate Ricciardo, while Carlos Sainz qualified tenth with an unrepresentative lap. With the paddock still trying to understand how Sebastian Vettel was knocked out of Q1 and with Mercedes effortlessly leading the way in front, qualifying two got on as per standard. Max Verstappen’s Toro Rosso was knocked out in P11, just two-tenths of a second behind teammate Carlos Sainz. Try as he might, Jenson Button couldn’t pull his McLaren out of Q2, but fended off Pastor Maldonado’s Lotus for P12, while Felipe Nasr was a distant 0.8 seconds behind the Venezuelan for P14. Romain Grosjean failed to set a time after gearbox gremlins kept his car garaged early in the session only for it to break down almost immediately after taking to the track, seeing the Frenchman’s final qualifying for Lotus off with a whimper. Under the setting Abu Dhabi sun track conditions on the Yas Marina circuit surface changed, making for an unpredictable qualifying. The brunt of the unpredictability was borne by Sebastian Vettel, however, when he failed to get his Ferrari into Q2 despite using the fastest tyre on his final run. Vettel appeared to lose power in the final sector of the circuit, but the German dismissed the rumour, saying that he wasn’t able to extract the most from the team’s agreed qualifying strategy. Almost all drivers used three sets of tyres, with many opting for a second run on the yellow-marked soft tyre bookended by laps on the red-marked supersofts, which was the favoured tyre on the cooling track. Mercedes’ cars were the exception, both using only two sets of the softest tyre, while Kimi Räikkönen also ran a counter soft-soft run, saving his supersoft tyres for the race. Jenson Button and Fernando Alonso struggled to keep their heads above the Q1 knock-out zone, with Alonso, rumoured to be considering a 2016 sabbatical year, initially holding the upper hand — but a killer lap from Button in the dying moments of the session relegated his teammate to P17 and put him through to Q2. The Spaniard finished ahead of Sauber’s Marcus Ericsson, who returned prematurely to the pits with a car problem, while Will Stevens, celebrating the one-year anniversary of his debut at this circuit with Caterham, led his returned Manor teammate Roberto Merhi in P19 and P20.